ned in local and dedicated networks, in the current clusters connected to the Internet, the interconnection technologies play an important role, since these clusters need to work in parallel, independent of their distances, to manipulate the data sets required by the applications. ort in terms of software, CPU and network. In other scenarios, a company can generate up to petabytes of information in the course of a year: web pages, blogs, clickstreams, search indices, social media forums, instant messages, text messages, email, documents, consumer demographics, sensor data from active and passive systems, and more. By many estimates, as much as 80 percent of this data is semi-structured or unstructured. Companies are always seeking to become more nimble in their operations and more innovative with their data analysis and decision-making processes. And they are realizing that time lost in these processes can lead to missed business opportunities. The core of the big data challenge is for companies to gain the ability to analyze and understand Internet-scale information just as easily as they can now analyze and understand smaller volumes of structured information. 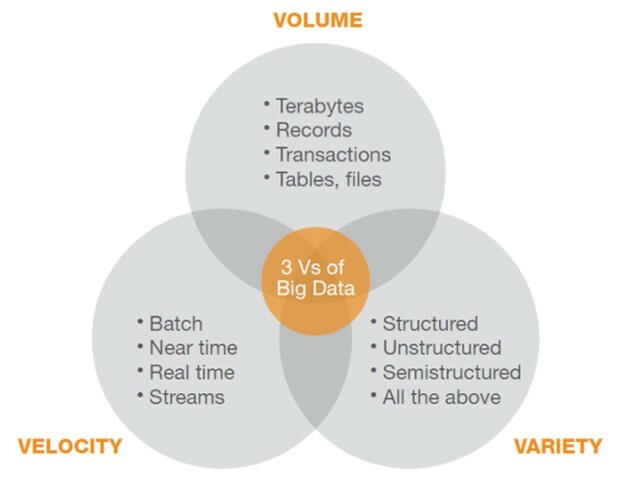 The above figure illustrates the features of the big data phonomena which is characterized by the ability of extracting insight from an immense volume, variety, and velocity of data. In this context, volume refers to the scale of data, from terabytes to zettabytes. Variety refers to the complexity of data in many different structures, ranging from relational to logs to raw text. Velocity reflects streaming data and large-volume data movements. We provide an overview of a set of basic concepts in the world of Big Data management and processing. We give an overview of a recently introduced wave of NoSQL systems and its suitability to support certain class of applications and end-users. We highlight a set of Database-as-a-Service systems that represent the new technology of hosting database systems in Cloud environment. We provide an overview of a set of large scale data processing systems and technologies. We give an overview of a set of important tools in the echo system if the Big Data management world.